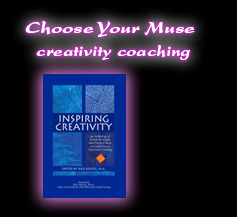 For a blast of motivation, check out my article, “Choose Your Muse: 10 Ways to Jump Start Your Creativity” in the anthology "Inspiring Creativity" (2005 CCA Press). Includes insights from 22 creativity coaches. $14.95. (Adista Designs). Kickstart your creativity in all its forms! Do you make time in your life to play and explore the world? Are you energized and ready to go every morning or caught in an endless loop of routine? 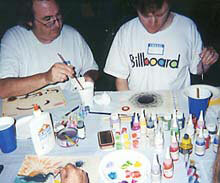 Reconnect with your personal vision and give expression to your unique experiences. Let me support you in your creative journey. 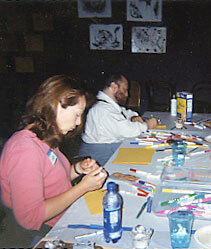 The “Choose Your Muse” Workshops include a variety of theater games, writing exercises, and painting activities to help get your creative juices flowing. Let loose – no special skills or experience are necessary, just a willingness to dive in and have fun! Contact me for individual, group or corporate rates and current availability, or ask me how a shot of creativity can revitalize your business.